MANILA—Columbian held off a gallant stand from Rain or Shine in the final quarter to take an 85-82 win in the PBA Philippine Cup at the Smart Araneta Coliseum in Quezon City on Wednesday night. Despite a slow start, the Dyip recovered in the middle two quarters but still needed to repulse the playoff-bound Elasto Painters down the stretch to bolster their own quarterfinal bid. ROS raced to an early double-digit spread, 26-15, at the end of the first quarter, but Columbian outscored the squad, 51-33, in the second and the third periods to take a 66-59 lead entering the fourth. The Dyip eventually led by as much as eight, 71-63, with 10:05 to play, but in just three minutes, the E-Painters forced a 73-all deadlock thanks to a 10-2 run. Jack Corpuz and CJ Perez scored on layups to keep Columbian ahead and was on track of holding off ROS. However, a Gabe Norwood trey brought the Elasto Painters to just one, 82-83, with 2:06 to play, and the Dyip could not put the game away. Luckily for them, that turned out to be their opponents' final hurrah as they went scoreless the rest of the way, and Reden Celda converted two free throws for the final tally even as James Yap's desperation shot to force overtime went off the mark. Rashawn McCarthy made 22 points, five rebounds, two assists, and one steal for Columbian, which moved up to 4-5. 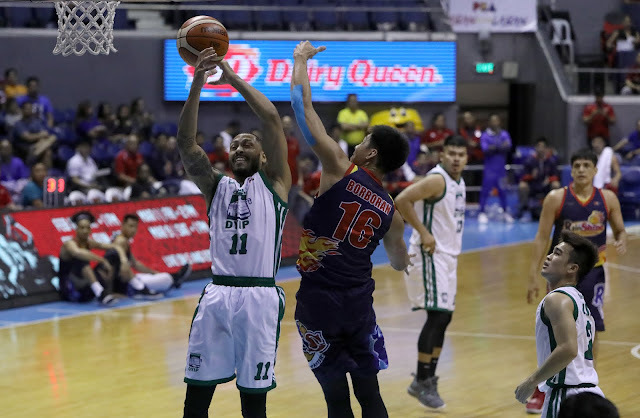 Corpuz ended up with 12 markers, eight boards, one dime, three blocks, and one steal off the bench, while Perez, despite an off night offensively, had a double-double with 11 points and 11 rebounds with three assists, two steals, and one block. Mark Borboran had a season-high 21 markers, four rebounds, and one swipe for ROS, which slipped to 7-3.